The 1886 Little Rock Baseball Association began as an attempt to create a state league, though the league failed to operate that year. Nevertheless, Little Rock proceeded to play an enthusiastic schedule of games. 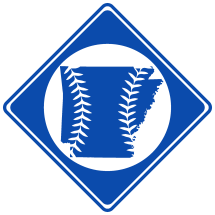 In effort to beat the Hot Springs club early in the season, Little Rock acquired numerous minor league players, resulting in the first ever professional baseball team in Arkansas. Among those signed were long-time big leaguer Tommy Corcoran, convicted murderer Charles Smith, part-time circus acrobat Floyd Lauman, and several other professionals. Little Rock went on to beat Hot Springs to become the self-proclaimed Champions of Arkansas. The team even felt confident enough to take on several semi-pro teams from St. Louis, and win. However, the season reached its apex when the St. Louis Browns of the National League played in Little Rock on October 28th and 29th. The Browns were billed as "the champions of all that portion of the world except Little Rock". However, after St. Louis beat Little Rock in back-to-back game, Little Rock was forced to admit that the Browns were indeed entittled to the Championship of the whole world. The final three games of the year were played against a team reported as the National League's St. Louis Maroons. However, only 4 of the Maroons regular players made the trip to Little Rock. The rest of the team was comprised of various St. Louis professionals. Either way, the Maroons won 2 of the 3 series games, ending Little Rock's season with a record of 12-7. Little Rock disbanded for the season, though a new professional team was created the next year and became a member of the 1887 Southwestern League, the first minor league in Arkansas. The Little Rock Baseball Association played a total of 19 games. See 1886 Little Rock Base Ball Association Boxscores. The Little Rock Baseball Association had a wide variety of players with many different backgrounds. Six of them were local players (Kimball, Powers, Counts, Wilder, Welch and Steinhoff), six were professionals from a disbanded Decatur, IL team (Douthett, Flynn, Callander, Reising, Lauman, and Smith) three were from New Haven, CT (Corcoran, Tracy and Miller), and two were professionals from St. Louis, MO (Brennan and Fogarty).